Adventures of a Face Painter: I Guess I'm the Family Face Painter! I Guess I'm the Family Face Painter! Several years ago I was hired for a house party to celebrate a first communion. This past October, it was time to celebrate the first communion of the younger sibling, so they had me back! These kids are seriously creative. 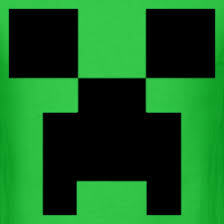 Ever hear of a Creeper? I hadn't. If you're wondering what's going on with the other side of the leprechaun's face, he wanted half Blue (the dog). Like I said, creative!